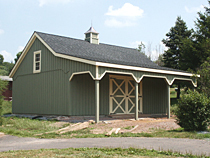 All of our Pole Barns are built using top quality materials and proper construction techniques. We made it standard to use all of the necessary bracing and stronger glue-laminated posts in order to make our buildings sturdier and to make them withstand stronger winds and harsh weather elements. 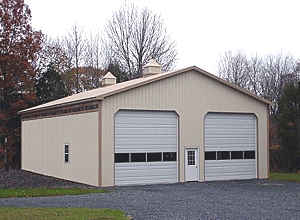 Most of our Keystone pole buildings come standard with 12" overhangs on all four sides to make them look nicer and to have better sidewall protection. Our builder however is very flexible on construction and is able to accommodate different options, plans and designs. Let our 10 Years of experience in post-frame construction work for you. We admit, we are not the cheapest out there and our goal is not to beat everybody's price. 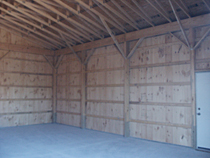 However, if we are going to build your pole barn, you can be certain, it will be constructed to your liking. We don't miss out on proper bracing and don't take any short cuts in material use. 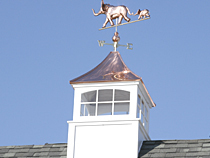 In fact, we take our time during construction to make sure your barn is built right and up to local building codes. Unlike some other companies that want to get in & out as soon as possible, our construction process might take a little longer, but at the end, what matters most is your satisfaction. 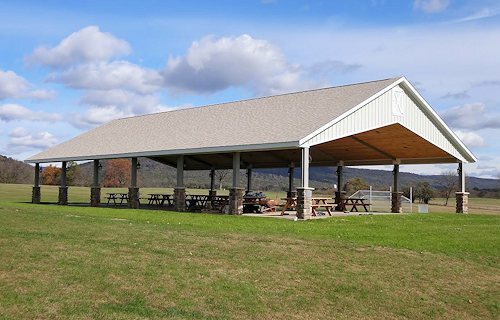 If you are looking for a pavilion, our builder can also design and construct different pavilions. See Pavilions page for more information.